Dr. Joel S. Pachter, Debayon Paul and colleagues from the Blood-Brain Barrier Laboratory at the University of Connecticut Health Center are using Imaris software to learn more about the neuroinflammatory processes that occur in diseases such as multiple sclerosis (MS). This research could provide information crucial for developing new therapeutic strategies that target one or more stages of the inflammatory process. The nerve damage that is characteristic of MS occurs from an autoimmune response that damages the myelin sheaths of nerve cells. The central nervous systems (CNS) signaling protein chemokine CCL2 plays a critical role in this process by guiding white blood cells, called leukocytes, across the blood-brain barrier. The researchers used an animal model of MS called experimental autoimmune encephalomyelitis (EAE) to identify the CCL2 sources that contribute to leukocyte migration in neuroinflammatory disease and to discover the mechanism(s) by which it is achieved. Cells that form the blood-brain barrier, specifically the star-shaped glial cells known as astrocytes and the microvascular endothelial cells that line the inside of the blood brain barrier, are major sources of CCL2. The researchers used mice, developed by Dr. Shujun Ge in their laboratory (J Mol Neurosci. 2009 Sep;39(1-2):269-83), in which the CCL2 gene was selectively eliminated from either astrocytes or endothelial cells, to evaluate how CCL2 from these sources contribute to neuroinflammation. “Three Imaris modules - namely, contour based 3D segmentation, spot creation wizard and Vantage plot - were extremely helpful for this study,” Paul explains. The researchers acquired high-resolution immunofluorescence confocal microscopy images of 60-micron thick spinal cord cryosections. They then used Imaris to visualize these sections in 3D, and to evaluate the extent of leukocyte transendothelial migration across the blood-brain barrier as well as the loss of the tight junction protein claudin-5 (CLN-5), both of which processes accompany developing EAE. CLN-5 is a major structural component of the blood-brain barrier. Mice with selective CCL2 gene knockout in astrocytes (Astro KO) or endothelial cells (Endo KO) display differences in 3D distribution profiles of luminal and perivascular cells. The researchers generated isosurface-rendered images from confocal z-stacks of 60-μm thick cryosections from wild-type (WT), Astro KO, and Endo KO mice at d16 EAE. The brain microvessels are highlighted in red. 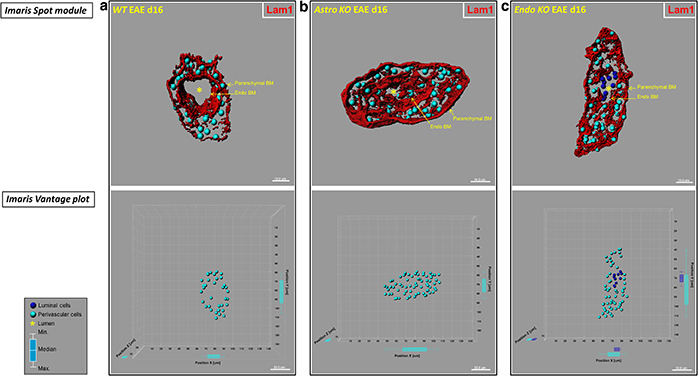 Top row: DRAQ5+ nuclei in luminal and perivascular compartments were optically isolated using 3D contour based segmentation, and pseudo-colored blue (luminal) and turquoise (perivascular), respectively. Using Imaris spot creation module, each nuclei is shown in the 3D dataset (volume) as a “spot object,” designating its luminal or perivascular location. Scale = 10 microns. Bottom row: Imaris vantage plots show the 3D distributions of luminal and perivascular cells along microvascular x, y, and z-axes in the corresponding vessels from the top row. Scale = 20 microns. (a) Representative WT vessel showing an empty lumen (*). (b) The lumen in the Astro KO vessel also appears empty (*) but partially collapsed, possibly owing to accumulation of perivascular cells that are missing guidance cues from deleted astrocyte-derived CCL2. (c) In contrast, Endo KO vessel shows evidence of congregation of cells in the lumen (blue), possibly reflecting stalled leukocyte transmigration in absence of endothelial-derived CCL2. Box-and-whisker plots are shown indicating the maximum and minimum spread from the median, in μm, of luminal or perivascular nuclei along the x, y, and z-axes. Reprinted from Debayon Paul, et al., J. Neuroinflammation 11:10. The researchers previously published a novel 3D contour-based segmentation approach that uses Imaris to quantify CLN-5 density within various CNS microvessel segments (see case study). They used this same method to investigate the EAE-associated alterations in CLN-5 density and step-wise leukocyte extravasation across the endothelial and perivascular compartments of inflamed microvessels from the two strains of cell-conditional knockout mice. The researchers say that it was critical to optically isolate and segregate the cellularity (due to leukocyte extravasation) associated with the microvascular lumen from perivascular compartments in an inflamed microvessel. “Imaris enabled us to optically resolve the boundaries of endothelial and parenchymal (astrocyte) basement membranes for this compartmentalization,” Paul says. They used Imaris spot creation wizard to represent each leukocyte as a “spot object” in 3D space to study the behavior of these compartment-restricted leukocytes. “Imaris Vantage plot module further enabled us to graphically display the different 3D profiles of these created spot objects, representing the spatial location of the separate luminal and perivascular leukocytes associated with inflamed CNS microvessels in CCL2 cell-conditional knockout mice with EAE,” Dr. Pachter says. Their data demonstrated that CNS astrocyte and endothelial pools of CCL2 each regulate different stages of neuroinflammation in EAE. Targeting drugs to these sources could more effectively mitigate neuroinflammatory disease. The researchers are now using Imaris to explore the alterations in permeability and barrier properties of the choroid plexus epithelium during evolving inflammation. The brain’s choroid plexus produces cerebrospinal fluid and might confer sites where immune cells can enter the CNS by accessing the cerebrospinal fluid. “Owing to the increased tortuosity of the choroid plexus capillaries and the underlying epithelial layer, information acquired from high-resolution confocal imaging of thick cryosections, coupled to Imaris based 3D rendering approaches, will be instrumental in unraveling such complex information,” Dr. Pachter says. Research Paper: Debayon Paul, Shujun Ge, Yen Lemire, Evan R Jellison, David R Serwanski, Nancy H Ruddle, Joel S Pachter. 2014. Cell-selective knockout and 3D confocal image analysis reveals separate roles for astrocyte-and endothelial-derived CCL2 in neuroinflammation. J Neuroinflammation 11:10.